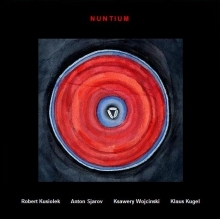 "Chapter 1" begins with Klaus Kugel' spare, soothing, resonant percussive sounds, but soon violinist Anton Sjarov's playing and wordless singing add an Indian-tinged element, while Kuisolek's electronics and bassist Ksawery Wójciñski's arco playing add a tension-loaded drone. The following chapter flirts lightly with Astor Piazzolla's nuevo tango, through mysterious short references that provide a lasting emotional impact. "Chapter 3" and "Chapter 4" feature Kusiolek's gift as a leader and an improviser who can convey a nuanced story through his expressive, dramatic playing. Both pieces sound sad but are still delivered with restrained elegance. "Chapter 5" presents the tight, almost telepathic interplay between Kusiolek and Sjarvo, both of whom can move instantly between minimalist gestures to high-octane dense improvisations, while Wójciñski and Kugel challenge these flights with their own invented chaotic sounds. "Chapter 6" is less intense but still follows a loose structure that patiently accumulates and reveals its clever, minimalist architecture. The classically trained Kusiolek closes this beautifully performed cycle with another mysterious, minimalist piece, often similar in spirit to the opening, proving yet again that even minimalist expressions can tell a rich and detailed story that can linger in the mind and demand many listens. Personnel: Robert Kusiolek: accordion, electronics; Anton Sjarov: violin, voice; Ksawery Wójciñski: double bass; Klaus Kugel: drums, percussion, sound-objects.